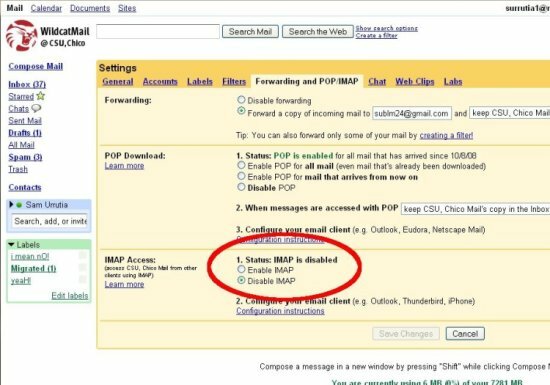 This document details how to enable IMAP in the WildcatMail Powered by Google web interface. This must be done before you using an IMAP client to access your WildcatMail. 2. Click on Settings in the top right corner of the window. 3. In Settings, click on the tab Forwarding and POP/IMAP. 4. Select the button Enable IMAP, and click Save Changes. You have now successfully enabled IMAP access to your WildcatMail account.